Happy Kids with Quality Haircuts! Chill-out Mom & Dad… at Funky Scissors haircuts are FUN! Funky Scissors Haircuts for Kids is a haircut with a FUN experience! 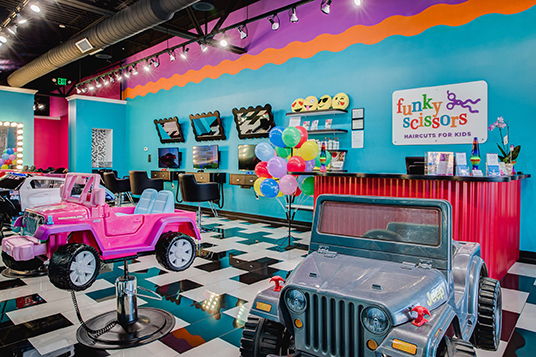 Our FUNKY fresh, trendy salon is the premier place for a children’s haircut in Dublin/Columbus, Ohio. Haircuts are for ALL ages (ages 0-teens)! Kids can choose to get their haircut in a fun vehicle. Choose from a Firetruck, Pink Barbie Jeep, Police Car or Jeep Wrangler. Kids & teens can watch their favorite show on NetFlix, have a blast playing XBOX, or be pampered in our fabulous glamour chairs. Baby’s First Haircut is always a super fun & special experience at The Funky Scissors! Our stylists are hip to the coolest trends in kid’s haircuts. So whether it is a classic do or a new look, you can be sure your child will feel confident & look fantastic at the end of their FUNKY FUN experience! So Cozy® professional salon hair care products are formulated using only the highest quality ingredients. None of the nasties (Parabens, Sulfates, Phthalates, Synthetic Color, Propylene Glycol, Formaldehyde. Free of Gluten, Wheat & Nuts.) 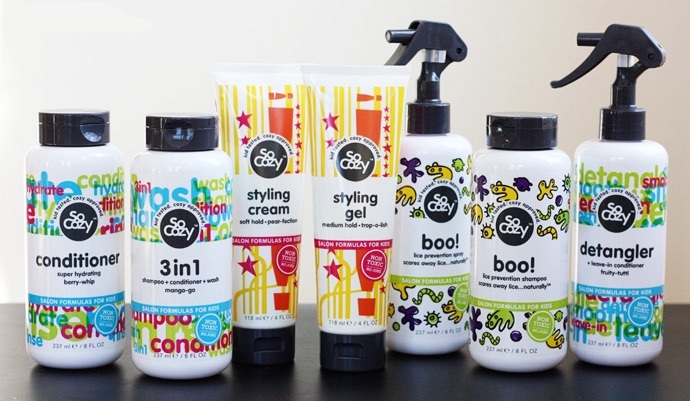 So cozy products are designed to solve problems such as knots, tangles, damage, frizz, dehydration, unmanageable curls, lice, static cling, bed head & swimmers hair) They are also enriched with fabulous, fun flavors. 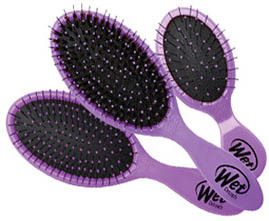 With its unique IntelliFlex™ bristles, the Wet Brush runs effortlessly through hair, detangling without pulling or tugging. There’s no pain, no tears–whether the hair is wet from the shower or dry; curly or straight; thick or fine. Finally, the tears (and curses) stopped. And just like the original Wet Brush, every product that comes from our brand makes it easier and more fun for you to create beautiful, shinier, healthier hair. Zach’s Wax™ is temporary hair color gel designed to give a radically different albeit temporary new look. With a one-ounce tube of color gel and a few spare minutes, blondes become pinkies, brunettes become redheads and redheads can turn their hair green. Through a growing network of charity organizations, Zach’s Wax is also a catalyst to raise funds for great causes. Zoya focuses on creating the highest quality products available to professional salons and spas. As the first to remove toxic ingredients such as toluene, camphor, formaldehyde, formaldehyde resin and DBP (dibutyl phthalate) from its formulations, Art of Beauty maintains its focus on the health and well being of salons, spas and consumers. At Funky Scissors Haircuts for Kids, the Birthday Girl will have the ultimate private Glamour Birthday Party experience! Guests will be treated like stars as they are pampered at the Funky Glamour Bar! Make-up, mini-cures, fancy hairstyles & glamour accessories will transform them into fashionistas! When the girls are all glammed up, they will walk the runway like a VIP on our exclusive illuminated stage & enjoy a fabulous FUNKY dance party. We love to pamper the little ladies! Balloons, Prizes & Lollipops with all haircuts! Complimentary minicure, braid & glitter spray with all girls haircuts! Book Online at funkyscissors.com or Call (614) 733-9090! Do your kiddos like prizes? YES!!! Balloons, Prizes & Lollipops with all haircuts! SAVE TIME BOOK ONLINE! funkyscissors.com Or Call (614) 733-9090! Cool haircut & so much FUN at Funky Scissors! Save Time Book Online funkyscissors.com or Call (614) 733-9090! APPOINTMENTS AVAILABLE! SAVE TIME BOOK ONLINE! funkyscissors.com For the BIG KIDS too! XBOX & NETFLIX! Balloons, Prizes & Lollipops with all haircuts! Complimentary minicure, braid & glitter spray with all girls haircuts! © FUNKY SCISSORS 2019. ALL RIGHTS RESERVED.